There are certain cars that come along that are instantly brilliant, and go straight to the top of their class. BMW's 'E39' 5-series is one such car - from the minute it made its debut at the 1995 Frankfurt Motor Show, replacing the much-loved E34, the executive saloon was touted as one of the best cars the German company had ever made. 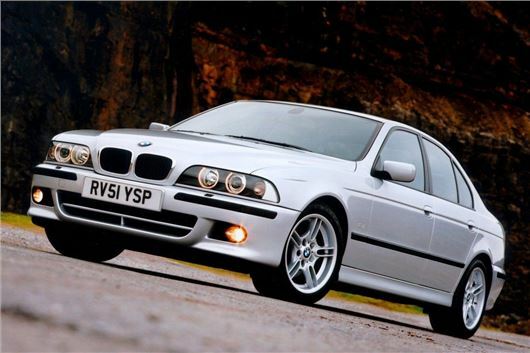 By the time it hit showrooms in 1996, the E39 had stoked up even more enthusiasm. The media were in raptures over the car's impeccable driving dynamics, while the build quality, performance and comfort were also first rate. The E39 was also an impressive piece of engineering, using more lightweight materials than any previous BMW, including a new aluminium subframe and - for the first time in a 5-series - rack-and-pinion steering. The new set-up gave fine handling balance and a level of agility that made the E39 feel like a much smaller car from behind the wheel. All variants were punchy - even the entry level 520i had 150bhp from its 2.0-litre straight six, while the 523i and 525i models were pleasingly rapid. If you wanted proper poke, though, the real stars of the range were the new V8s - the 535i and 540i. Refined, powerful and with a wonderful exhaust note, they were also surprisingly economical, especially on the motorway. It's no wonder, then, that the E39 was widely regarded as the best executive car on the market by all of the contemporary car magazines. The E39's armoury was strengthened even further in late 1996, with the addition of the 'Touring' estate model, which featured a pop up rear screen and an extremely capacious load bay. If anything, the Touring was even more handsome than the well-proportioned saloon, and again went instantly to the top of its class. Indeed, the only weak link in the range was the diesel engine. The 525 TDS used the old 141bhp six-pot turbodiesel from the E34 (also found in the Vauxhall Omega), and while it was a tough unit, refinement and performance weren't its strong points. BMW's answer was, in 1998, to yet again create a class leader. The new 530d used a three-litre six-cylinder engine newly developed for the model, with incredible performance and torque. It was, in the eyes of many, the best diesel car in the world. It was followed up in 2000 with a 2.0-litre four-cylinder turbodiesel in the fleet friendly 520d to coincide with a mild facelift - a car that might not sound that exciting, but was more than capable of delivering a satisfying drive. The E39, then, was a true great. One of the best cars of its era, if not the best in terms of its context. Its status as a future classic is guaranteed, but don't buy one with your eyes closed. Early 530ds aren't renowned for their reliability, while E39s are currently cheap enough for people who can't afford to properly maintain a BMW to own one, and that means there are several ropey high milers out there, some with questionable modifications. Don't buy one of those. Instead, seek out a well maintained and totally standard example. A good maintenance record is far more important than mileage, and be wary of rust, especially around the rear arches, trailing edge of the sills and on Touring tailgates. E39s are tough cars, but they're not immune to rot, especially with the oldest examples now being over 20 years old. They don't look it, though, do they? A truly handsome and brilliant car. Possibly the best car ever made.Have a 1998 528iSE,260,000 miles,still does 145MPH on the Autobahn.Worth about a grand according to 'we buy any car' or whatever.And faster,better made and much nicer to own than my company 2017 Audi A4 TDI. On my third E39... started with a 525d followed by a 530d and now driving a 2002 530i. They are brilliant... best cars ever made and so much car for the money. Solid, reliable, refined and comfortable. For a second hand cheap car it's a total no brainer. Just a shame they stopped making them. THE best car in the world bar none. I drive a bmw 530i m sport champagne 2. Absolutely the best car I have ever had. It's finished in metallic black and cream leather interior. It's a 2003 limited edition I've been told, to commemorate the end of the E39 engine. It's so reliable and responsive, an amazing drive, I'm always cleaning it and looks stunning when polished. I'm always having notes struck to the windscreen asking if I want to sell it, the answer is always no. It's also a petrol one. There's only one thing missing, the phone handset which sits on the centre console. I had a 525d and it was the best car I have ever had, fast, economical and pretty reliable. I still miss the Shaeffer green motor.........the body styling was understated and tasteful, in fact the latest version seems to hark back ! Your comments about the engine are crap! I have had two 528i's in Manual gearbox form, and both were briliant cars, especially the later version I had with the twin Vanos version of the engine. If I could critisise them slightly is that I found the 528i slightly underpoweredin some situations due to the car being heavy. Of course the V8 versions were more powerful but they had a steering box rather than rack and pinion which takes a lot of enjoyment from the drive. The 530i or an Alpina based 6 cylinder petrol would probably be the models to have simply because of the steering. I own a 525i touring with m tec pack and full grey leather interior. Love the car . Smoothest driving car I’ve ever owned with every receipt and service from new. Paid 1400 for it . Bargain. I own a BMW 525i SE (2002) is a truly the best car i have ever driven. It is a joy to drive and own and i have lost count of the amount of people who have made me offers on the car (its Glazier gree/comfort seats in mint leather/low miles of 50,000). I have done around 5000 miles in it thus far and it has been faultless. It sticks to the road like glue and feels so well balanced. Engine is eager and overtaking on the motorway is a doddle. Another bonus is the mpg i get (with careful driving) both urban and on the motorways. The previous owner only did 4000 since 2008 until 2016 (used for shopping trips) but car needs a full service/auto fluid change/rocker cover gasket changing and luckily there is an idie BMW garage not far from where i live. The car looks stunning and oozes quality and class and has a real presence about it. Yes service costs can be high (especially dealer prices) but find a good indie and costs are not so crippling. (Or maintain it yourself). Its a car i feel very proud to own and like i have said a joy to drive and thus far has been very reliable. Not surprised folk are saying it will be a future classic and totally agree with with the comments being made by various bodies that the car was the best ever made by BMW and one of the best cars in the the world in its day. I've owned 4 E39's, First being a 97 528iSE Touring Manual fully loaded, and i mean "fully loaded", 16 way lecci seats, phone, navigation, TV, xenons, blinds and double friggen glazing to name a few. I still own that car. with nearly 200k shes still my daily. I had a 98 528iA SE saloon also fully loaded, a poverty pack 01 525d SE touring auto and an ex foreign diplomat black sinister RHD 99 523i SE Touring auto with the champagne style interior. In my opinion the E39 is one of BMW's finest achievements and by far a car to be proud to have outside your house. They're getting few and far apart now especially Touring's. Once you drive an E39 then they're in the blood. I will own more and yet still keep the one i have. 4 Years of ownership and she still to this day puts a huge smile on my face. A lil story for those who have no idea, Jeremy Clarkson drove a 528i SE Touring manual across africa to find the source of the nile, It was the only car to make it with all the wheels still attached to the car. He claimed he'd quite happily drive the car back to england! Something along thoes lines anyway. "Top Gears greatest car ever, a £1500 banger!". "Try one, You wont be disappointed?" One of the best cars I ever owned was a 1998 523i auto bought in 2001 with 30k on the clock. It was Biarritz Blue with black leather and was an absolute joy to own, until (with about 80k miles in 2006) the 'bakelite' coolant reservoir apparently cracked causing the engine to overheat and blow the head gasket. It seems this was a known problem - had the car serviced main dealer and specialist religiously and no one mentioned the reservoirs can age and crack. Put me off BMW a bit - beautiful car ruined for a piece of cheap plastic.